It is not possible to talk about the Common teal (Anas crecca) without mentioning the Garganey (Anas querquedula) and vice versa. Too many relationships exist between these two species, too many bonds and too many stories do link the lives of these two dabbling ducks that stand among the smallest of the palearctic. The Common teal (Anas crecca Linnaeus 1758) belongs to the order of the Anseriformes and to the family of the Anatidae a very vast group that presently includes 152 species scattered in all continents. The references common to these two species are really so numerous even if they display, as we shall see later on, evident charateristics and behaviours quite different though linked between them. 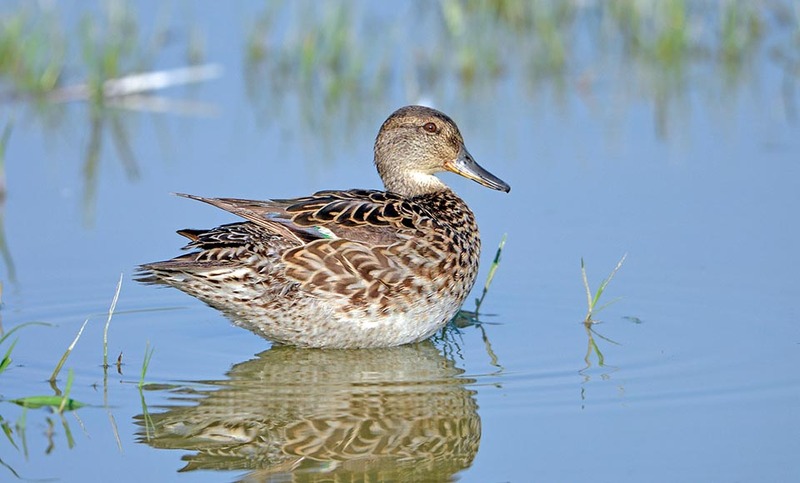 A first relation is related to the vulgar name given by the French to the two ducks that unites them both in the terms but differentiates them in the seasonal recurrence: sarcelle d’hiver for the common teal and sarcelle d’été the garganey. Same situation for the scientific name assigned by Linnaeus to the common teal. Anas crecca gets its origin for the genus, from the Latin term of the same name, “anas”, with meaning of duck whilst for the species the reference is the Swedish term “kricka”, name locally given to the common teal and probably of onomatopoeic origin but referred more to the garganey, whose typical cry is the rightly a continuous “crekcrek” of link and call. It should be interesting to know which metre has actually used Linnaeus, he himself Swedish, in chosing the name that then he has assigned to the species. Another confusion may arise between the English name Teal and Garganey given respectively to the two birds. 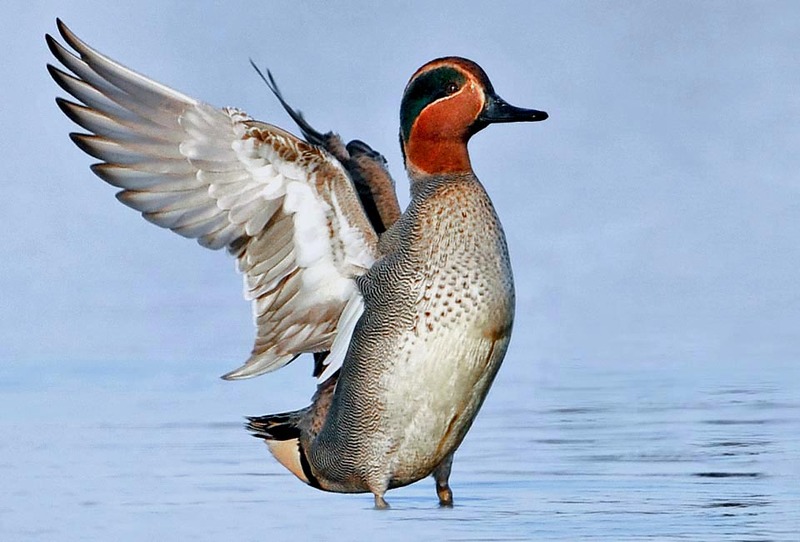 The etymology of garganey, comes from the Padanian dialect garganel or garganello that, stangely enough, indicates more the common teal than the garganey. Just to complete, we add that the females of the two species are practically similar on the field and absolutely indistinguishable when in eclipsal livery, except some minor differences detectable only by experienced birdwatchers. 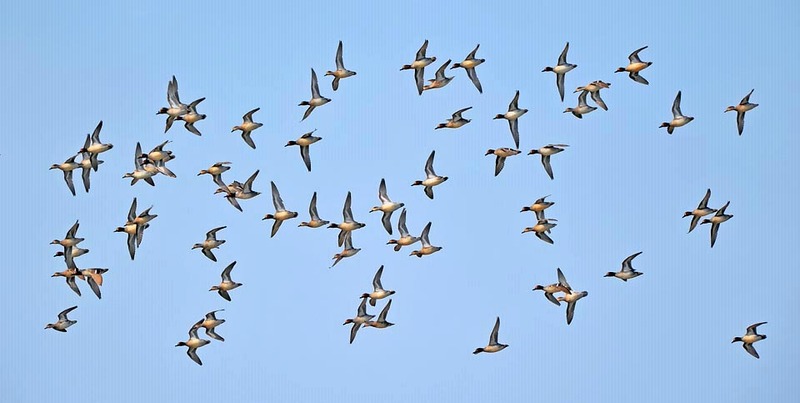 The common teal is a very fast duck, a real jet in the world of the anatids already particularly prone for developing high speeds during the flight. The characteristic morphology of the ducks, with a long neck, a stocky body, small and sharp wings with reduced lifting capacity and little developed remiges, requires the necessity of expressing a high cruise speed, in order to be able to stay in the air. 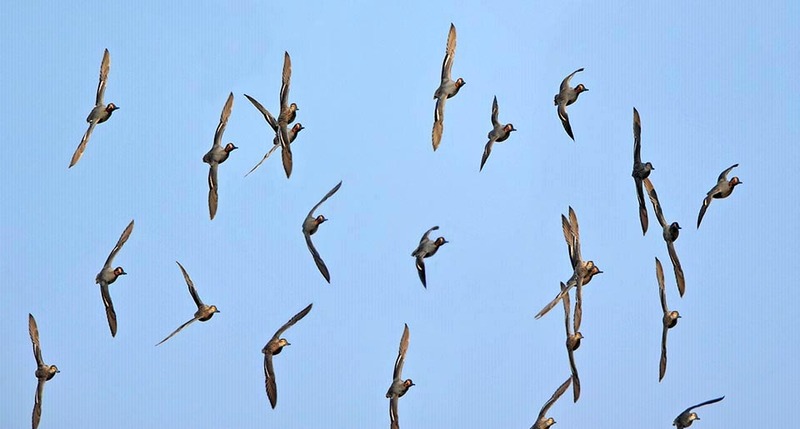 The common teal defeats them all in this activity so much that it can carry out, when flying in compact flight with its conspecifics, aerial acrobatics like the waders, with sudden spins and turns, tonneaux and diabolical slides, unusual for a duck. Moreover, it can make the so-called burst, an extremely rapid take-off and perfectly vertical but at a speed unthinkable from a standstill, just like a sudden burst that bewilders the aggressor when done in group. So rapid is the take-off speed, so fast is ditching. Irresponsible dives that end practically splashing in the water with loud impacts. Here are some vulgar European names: in English Common Teal, in Italian Alzavola, in German Krickente, in Spanish Cerceta Común, in French Sarcelle d’hiver and in Portuguese Marrequinha-comum. 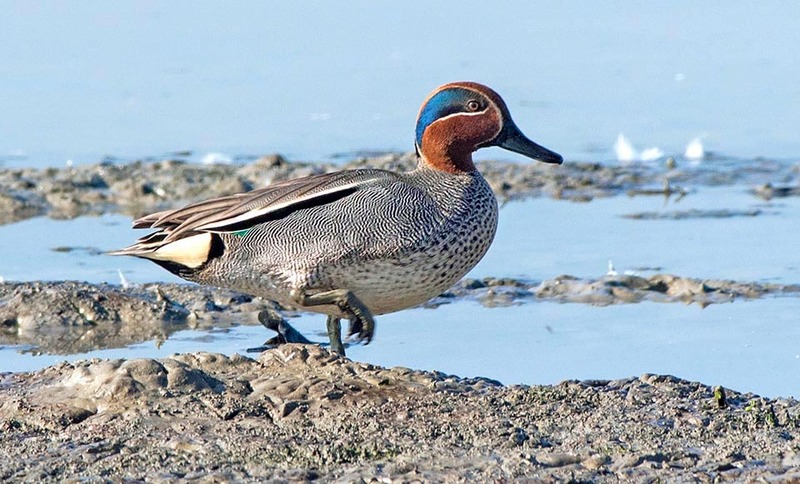 The common teal has a very vast nesting range that practically covers all emerged lands above the 45° of latitude, and up the coasts of the Arctic Ocean, of America, of Asia and of Europe. It nests also in Iceland but is practically absent in Greenland even if in Canada it can be found present at the same latitude. Europe is the only continent not fully inhabited. As a matter of fact, besides being totally missing in the Mediterranean area, from the Iberian Peninsula, the Balkan one and Anatolia, is sporadic also in the central-western and oriental parts of the continent, with isolated populations not always constant. Also in Italy is present in reduced and standoffish number, with few couples relegated mainly in the Po Valley. The northernmost populations are regular migrant but at short range, so that they reach the southern part of their original territory, venturing at times even more south but usually remaining inside the continent they belong. The European colonies winter in the Mediterranean area and in limited number in some locations of the facing African coast. The Asian ones in Japan, southern China and Indian peninsula with some jumps up to the high Nile Basin for the central-Asian and the Cis-Uralic ones. The North-American populations, in the southern USA and in Mexico. And this explains why the French call them sarcelle d’hiver, winter teal, rightly the period when we find them in huge number on their territory. During the summer, in the nesting period, the common teal prefers still water surfaces even if small, placed inside thick but low vegetation, lagoons bordering important water streams, semi-flooded lands close to small lakes but also in humid plains well distant from the waterways but covered by thick grassy layer where to place the nest. It is also present in the tundra, in the small water surfaces forming with the summer thaw but always surrounded by a grassy vegetation suitable for hiding the nest. During the winter its habitat widens to territories with more varied vegetation. 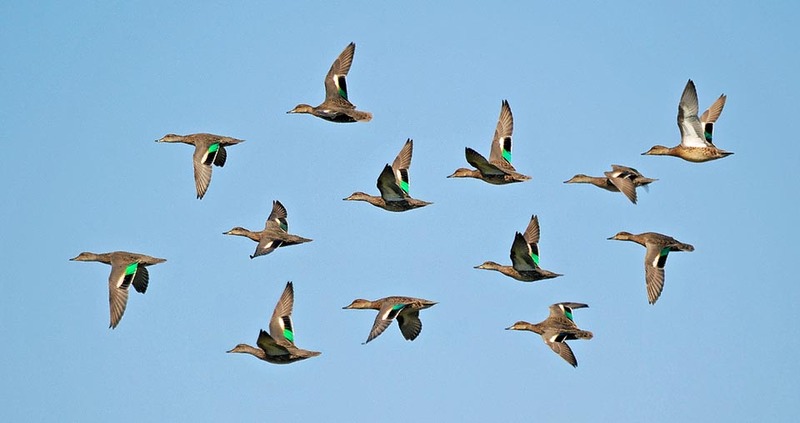 First of all, in this period the common teals merge in very numerous groups so much to form flocks at times of thousands of specimens and together they love to frequent ampler and more open environments, water surfaces surrounded by reeds, coastal swamps, lagoons, small artificial lakes, estuaries, shallow lakes but also slow flowing rivers. The common teal is a surface duck and finds the food immersing deeply the head waving the legs in the air but occasionally, as for fun, plunges for very short dives in few centimetres of depth but with very fast and noisy actions surely not good for getting food but instead for taking a bath or as for taking off some parasite from the body. It is a rather reserved species and never takes advantage from habitats shared with the human beings or with human activities. On the contrary, even if being an elusive and reserved species, is one of the most common victims of the hunters of the whole world that during the shooting season get with them consistent game-bags. 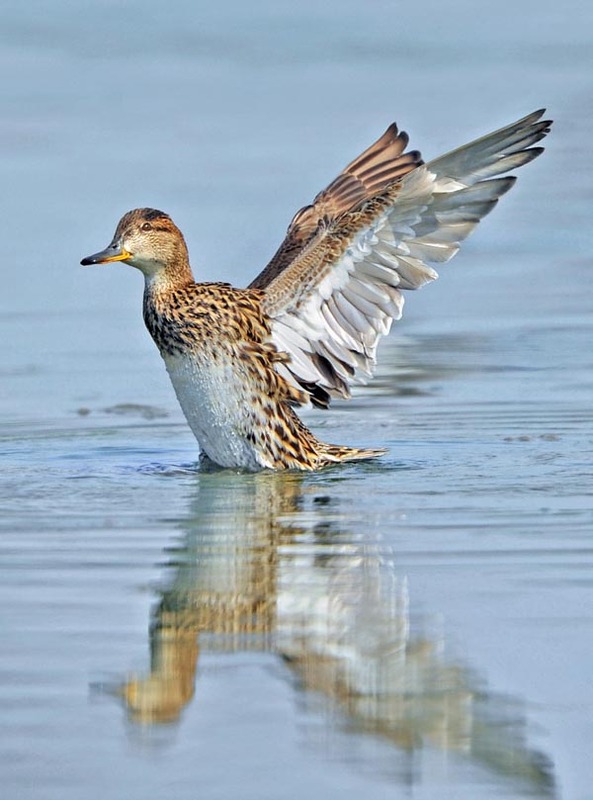 The Anas crecca is the smallest duck of the palearctic, measuring only 35 cm of length in the male and little less in the female, a weight of about 350 g and a wingspan of 70 cm. It has narrow and pointed wings so much to seem, when flying, a very fast limicolous. The sexual dimorphism is remarkable having the sexes liveries absolutely different between them and not at all connected or imitated. Surely, like in all the anatids, is valid the concept that the female having to brood in open air, needs a completely mimetic camouflaging and little visible from above while crouching on the nest. The plumage of the female is totally brown spotted of yellowish and similar to very many other females of anatids especially to the garganey that at times results indistinguishable excepting a slightly shorter bill marked by small orange streaks. The bright green speculum feathers almost always visible even with closed wings and does not have an evident whitish eyebrow like the garganey. The bill is greenish grey but displays small orange smears at its base and along the border of both mandibles, one of the small marks that distinguish it from the similar garganey that, conversely, has it totally grey. On the contrary, the male, when in nuptial livery, displays a real palette of colours. The head is completely of vivid hazelnut colour, is wrapped by an ample emerald-green strip with bluish reflections that starting from the front of the eye goes down, widening, to join on the nape. As delimitation of the strip, in the lower subocular part, passes an extremely delicate yellow line that accompanies up to the cheeks this strip marking distinctly its limit. The neck and the sides are finely marked by very thin lines of white and black colour, parallel and alternate that fade on the low chest to become blackish drops and then to disappear and become compact cream white up to the height of the undertail where, limited by a very black thick line, transforms in an ample yellowish white spot much visible also from far away and in particular when flying. The speculum is of very bright green colour tending blue from some angles and little visible when staying on the ground but shining, when in flight, reflected by the sun light. When in the air, it displays a white underwing and on the alar cover besides the visible green speculum also a blackish one on its side and both surmounted by a thin, but very marked, white belt, in turn sided by others of brown colour that run parallel to the wing. The bill is tiny and rather short of blackish colour with a slight upward appearance whilst the legs are greenish. Reduced tail like most of the ducks and slightly pointed. In the eclipsal period both sexes and the youngs wear liveries similar to the female, difficult to distinguish if not observed closely and with attention. Though having a very vast territory, the common teal is quite limited in the number of subspecies. Only two of them have been accepted by the modern taxonomy, the Anas crecca crecca of Europe and Asia, and the Anas crecca nimia limited to the Aleutian islands. 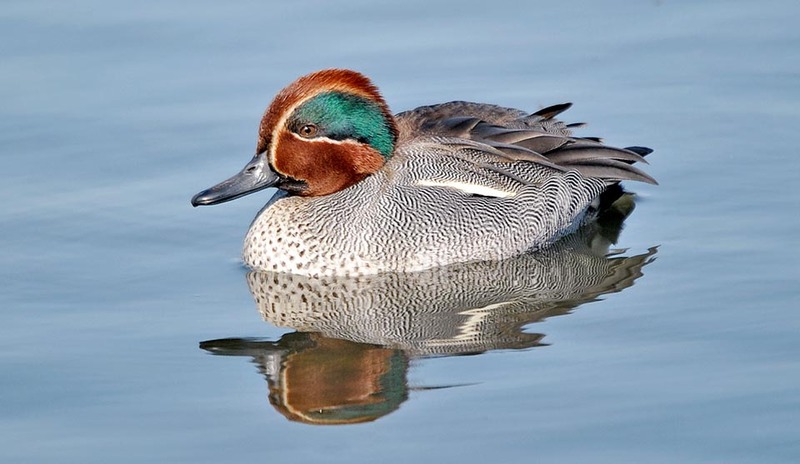 The subspecies Anas crecca carolinensis, typical of the American continent has been definitively placed as a single species and classified with the common name of Green-winged teal (Anas carolinensis). The common teal is a very faithful and assiduous mother. It is she who is interested in the choice of the place and to the construcrtion of the nest and always she who cares the brood. The nest is placed in dry part of the ground, hidden among the high grass, and covered by the dense grassy vegetation that hinders the view from above. Are piled dry grasses leaves and roots that are then delicately covered with its own down to form an ample very soft cup. It lays 7-12 cream white eggs rather small for a duck but in line with the very reduced dimensions of this tiny bird. The brooding lasts about 20 days during which the male keeps watchful thereabout but only for defending the territory and communicating eventual intrusions of predators. The nest may be even at some hundreds of metres from the closest water surface but it is not rare to find it directlty on the bank of the water stream. The walkway created by the female in the grass, when it leaves the nest for reaching the feeding place, is probably the only detectable trace of the presence of the nest of this elusive bird. 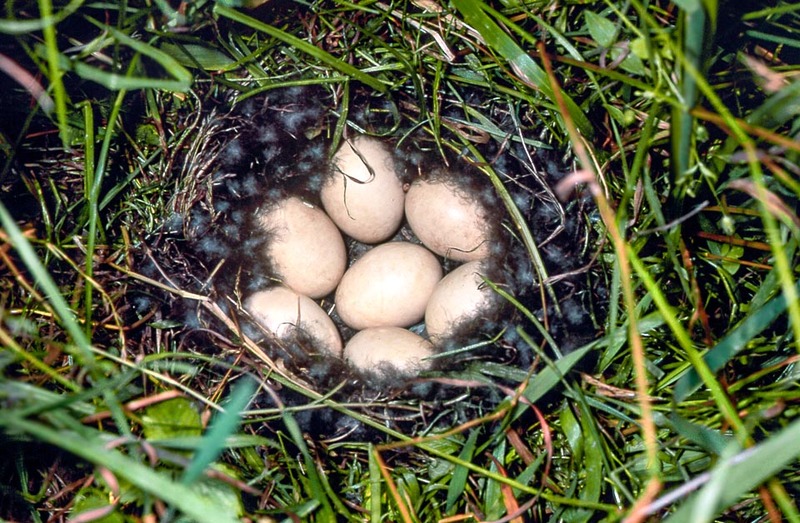 The hatching occurs almost at the same time for all the laid eggs and the ducklings are immediately capable to abandon the nest and to follow the mother, up to the nearest pond they will never abandon until they reach the dimensions of the adults and the complete autonomy in the flight. They will keep with the female for about 4-5 weeks even if they are at once able to feed autonomously and then to render themselves totally independent. The common teal nourishes mainly of vegetables preferring the grasses and the freshwater algae it takes from the bottom wallowing with the bill the submerged surface. It loves a lot grains and seeds in general that it finds moving during the night on cultivated or rich of graminaceous plants even at considerable distance from the locations where usually spends the day. It nourishes also of larvae of aquatic insects, small crustaceans, molluscs and larvae. This duck spends about three quarters of the day busy in looking for food and therefire must take advantage also of the twilight and night hours to satisfy its own feeding necessities. This greed can be reason the the remarkable energy that it expresses in its movements, always active and tireless. It is a very noisy species in any moment of the year and of the same day in particular by the male and in the social moments of gathering with the conspecifics, during which it emits continuously the typical and muttering “guit guit guit” of connection. Considering the enormous territory occupied and the adequacy of the single local populations, this species is not considered as endangered. → To appreciate the biodiversity within ANSERIFORMES please click here.